We’ve spent this weekend at my favorite place–the beach. Unfortunately between Jack’s sleeping/eating requirements and some bleary weather we really didn’t spend much time at the beach at all. Yesterday we finally got tired of sitting around waiting for the sun to come out and went to a local arcade. Jack was mesmerized by all the lights and sounds and the grownups had a good time acting like kids again. My favorite was the skee-ball, but Nick enjoyed trying to beat his own high score at the sledgehammer game. Forty bucks later we traded our 1,350 tickets for a finger puppet, a small toy ball, and three packs of twizzlers. Here’s Nick’s brother Tim displaying our bounty. Of course the sun had come out while we were inside playing. We shared a cabin at Alabama’s Gulf State Park with Tim and his girlfriend Jessica. The state park is a great budget friendly lodging option and the cabin, while small and outdated, was really quite comfortable. It helps when the company is so good. We spent our evenings playing cards and drinking beer on the screened porch. Last night on our way home from dinner we realized the sun was out and we had an hour until Jack’s bedtime, so without even running back to the cabin to change Jack into proper swimming attire we seized the opportunity to finally introduce him to his mama’s first love, the ocean. Baby, meet sand. He loved it so much that he screamed in protest when we picked him up to go home, so we put him back down and let him play a little more. Of course when we woke up this morning there was not a cloud in the sky. So while Tim and Jessica were still sleeping we slathered Jack in sunscreen and brought him down to the beach for a proper romp in the sand and surf. And this time I put the iPhone down so I could focus on seeing the ocean through the eyes of my sweet boy. So I don’t have any pictures, but I do have some solid memories. We’re driving back today. It’s so nice to be able to sneak away for a weekend like this, but I’m not ready to get back to the grind again. I wish we could’ve stayed longer! 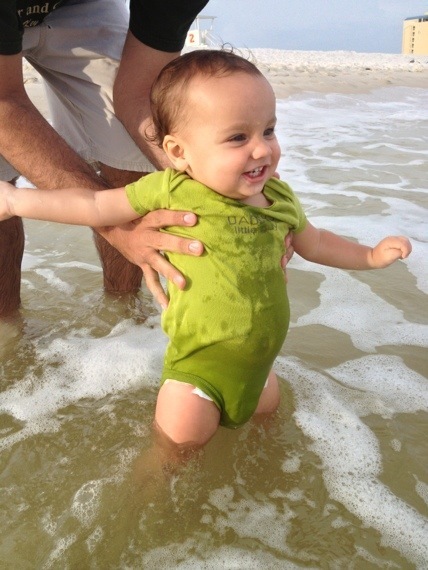 Most babies are afraid and cry when they feel the sand on their skin as well as the water washing over them. Not Jack! Looks like he really enjoyed himself! Oh he did! He was so happy! I love to see Jack enjoying the beach like that. While I didn’t grow up anywhere near an ocean, I spent many hours on a beach at Lake Springfield.Ask your Mom about the joys of the Press Club. The story goes that my sister and I were both swimming before we could walk because we were sitting on the beach and just rolled over on our tummys and started swimming. It happened first with my sister and then me. It looks like Jack will be a water baby too. That is so funny! Jack was trying to crawl face first into the waves. He was fearless! I think he loves the water as much as we do!